The human papilloma virus causes most — but not all — cases of cancer of the cervix. Two medical groups say doctors could replace the Pap smear with a different test to screen many women for cervical cancer. But that recommendation, included in an "interim guidance" released Thursday, is highly controversial; other experts call it premature. For years, physicians have recommended that women routinely get Pap smears to catch any signs of cervical cancer early. That strategy, which requires taking a scraping of cervical cells to check for signs of abnormalities that can presage cancer, has significantly reduced the number of U.S. women who get the disease and die from it. 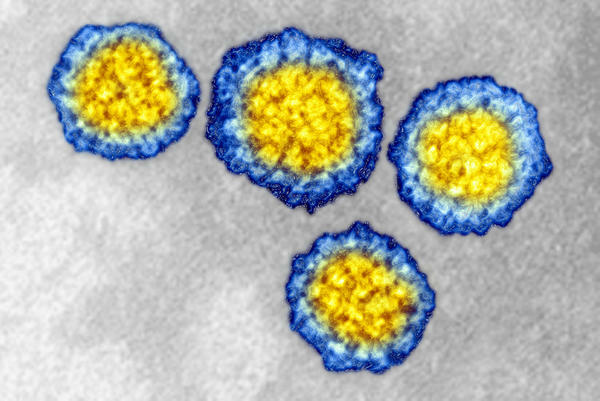 But the human papilloma virus is now thought to cause most cases of cervical cancer; last spring the Food and Drug Administration approved a test for the HPV virus as a primary screening test for the malignancy. That move by the FDA prompted an intense debate about whether an HPV test should merely supplement or perhaps replace the Pap test. As a result, the American Society for Colposcopy and Cervical Pathology and the Society of Gynecologic Oncology convened an expert committee to review how the HPV test should be used. In the resulting report, released Thursday in the journal Gynecologic Oncology, the committee concludes that doctors could consider the HPV test a primary screening test for women beginning at age 25. "Pap smears are probably missing a fair amount of cancer and precancer in women," says Warner Huh of the University of Alabama, who chaired the committee. "The HPV test really outperforms Pap smears when it comes to cancer detection as well as precancerous detection." Using the HPV test more widely will allow doctors to "pick up disease in women that could be treated earlier so they don't go on to develop cervical cancers," Huh says. Still, not all doctors agree. Members of the American Congress of Obstetricians and Gynecologists, for example, say it's just too soon to make such a change; some worry the results will unnecessarily frighten many women. "So many women get HPV who will never, ever get cancer," says Diana Zuckerman, who heads the National Center for Health Research, a research and advocacy group. In many cases, an infection with the virus is just temporary; it quickly disappears without causing any problems. If lots of women start getting tested for HPV, Zuckerman says, many women will end up getting expensive, painful and possibly harmful follow-up tests they never really needed. "We think it's confusing to patients," she says. "It's confusing to physicians. And the testing involved and the anxiety involved may have a lot of risks both physical and mental that are much higher than any benefits those patients are likely to have." Another worry is that HPV isn't the cause of all cases of cervical cancer. If you substitute the HPV test for a Pap smear, she says, "You could definitely miss out on some women who will in fact develop cervical cancer." So for now, she says, the best bet in screening is to keep using both tests. Some doctors are recommending a big change in a key part of women's health care. Two medical groups say a new test should replace the traditional Pap smear, used for generations to screen for cervical cancer. And as NPR's Rob Stein reports, that recommendation is controversial. ROB STEIN, BYLINE: For years, doctors have recommended women routinely get Pap smears to catch any signs of cervical cancer early, and it's worked. The number of women getting cervical cancer and dying from the disease has plummeted. But Warner Huh of the University of Alabama says the Pap test's far from perfect. WARNER HUH: Pap smears are probably missing a fair amount of pre-cancer and cancer in women. STEIN: He chaired a committee put together by two medical groups, the Society of Gynecological Oncology, and the American Society for Colposcopy and Cervical Pathology, to decide whether a new test is better. And Huh says the committee concluded - it is. It's a test for the human papilloma virus, HPV, which causes most of the cervical cancers. HUH: The HPV test really outperforms Pap smears when it comes to cancer detection as well as precancerous detection. STEIN: So the groups are recommending that doctors could start using the HPV test by itself to screen women for cervical cancer beginning at age 25. HUH: We're going to pick up disease in women that could be treated earlier so they don't go on to develop cervical cancers. STEIN: But not everyone agrees. Many experts, including those at the American College of Obstetricians and Gynecologists, say it's just too soon to make a big change in cervical cancer screening. And there are some big worries. One is that it will end up just scaring a lot of women for no reason. Diana Zuckerman heads the National Center for Health Research, a research and advocacy group. DIANA ZUCKERMAN: The main concern that we have about these guidelines is that so many women get HPV who will never, ever, get cancer. STEIN: The virus often just goes away by itself and never causes any problems. But if lots of women start getting tested for HPV, Zuckerman says, lots of women will end up getting expensive, painful and possibly harmful follow-up tests they don't really need. ZUCKERMAN: We think it's confusing to patients, it's confusing to physicians and the testing involved and the anxiety involved may have a lot of risks, both physical and mental, that are much higher than any benefits those patients are likely to have. STEIN: Another worry is that while most cervical cancers are caused by HPV, not all of them are, so there's a risk of relying on the HPV test alone to screen women. ZUCKERMAN: You could definitely miss out on some women who will in fact develop cervical cancer. STEIN: So Zuckerman and others say, for now, the best bet is to keep using the Pap test along with the HPV test to screen women for cervical cancer.